By 2016, car sharing will be a $6 billion annual business according to forecasts by Frost & Sullivan, with half the revenue in the United States. Zipcar’s IPO filing shows its market leadership with 400,000 members. Zipcar has already acquired Flexcar in the U.S. in 2007 and Streetcar in the U.K. in 2009. An IPO would enable faster growth, other acquisitions, and debt repayment. The firm plans to expand into 100 major metropolitan areas in the U.S., Canada, Europe, and Asia, from its current 13 markets. The firm will also expand its fleet which already includes hybrid cars and plug-in hybrids. The SEC filing shows that organic growth was only moderate in 2009 and that the firm is not yet making profits. Zipcar operates the world’s leading car sharing network. Founded in 2000, Zipcar provides the freedom of “wheels when you want them” to members in major metropolitan areas and on university campuses. We provide over 400,000 members, also known as “Zipsters”, with self-service vehicles that are conveniently located in reserved parking spaces throughout the neighborhoods where they live and work. Our vehicles are available for use by the hour or by the day through our easy-to-use reservation system, which is available by phone, internet or wireless mobile devices. Once the vehicle is reserved, a Zipster simply unlocks the vehicle with his or her keyless entry card (called a “Zipcard”), and drives away. Our all-inclusive rates include gas and insurance so Zipsters can easily estimate the total cost of their trips. Zipsters choose the make, model, type and even the color of the Zipcar they want based on their specific needs and desires for each trip. Upon returning the Zipcar, the member locks the vehicle and walks away, free from the costs and hassles of car ownership. Zipcar provides its members a convenient, cost-effective and enjoyable alternative to car ownership. We operate our membership-based business in 13 major metropolitan areas and on more than 150 college campuses in the United States, Canada and the United Kingdom. We target large, densely populated markets with high parking costs and strong public transportation systems. Based on these criteria, we initially focused our operations in three metropolitan areas: Boston, New York and Washington, D.C. These metropolitan areas have since developed into large-scale car sharing markets that continue to grow. We then applied our knowledge and experience to develop and grow additional markets, such as San Francisco, Chicago, Toronto, Vancouver and London as well as to university campuses. We further increased our geographic footprint to include Seattle, Portland, Atlanta, Philadelphia and Pittsburgh through a merger with Flexcar, Inc. in 2007. Our revenue has grown from $13.7 million in 2005 to $131.2 million in 2009. In April 2010, we acquired Streetcar Limited, a car sharing service in the United Kingdom. Our presence in London will also help support our expansion into other European markets. Streetcar’s revenue was $23.1 million in 2009. We believe we have several significant advantages over our competitors. First, we offer our members the largest fleet of car sharing vehicles in nearly all the major markets in which we operate. Second, because our business is solely focused on car sharing, we are committed to ensuring the highest quality member experience. Third, we have a proprietary and scalable technology platform specifically designed for car sharing. 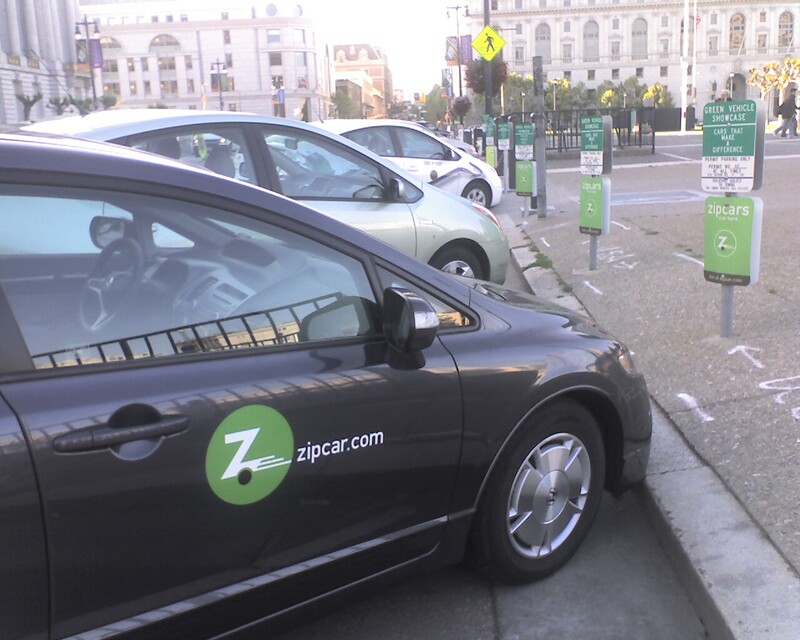 Fourth, Zipcar is one of the most recognized brands in car sharing. Lastly, we have accumulated ten years of car sharing data, which we can leverage to drive loyalty and growth by continually enhancing our member experience. A cost saving alternative to car ownership. Convenient neighborhood access to a varied fleet of makes and models. Freedom and flexibility beyond other alternatives such as taxis, public transportation and traditional car rental. A smart, socially responsible and sustainable lifestyle. According to recent studies by the Urban Land Institute, transportation in major metropolitan areas represents a significant cost burden. In regional studies performed in the Greater Boston, Washington, D.C. and San Francisco Bay areas, transportation costs represent between 17% and 20% of household income, which translates to $11,927 to $13,375 in average annual transportation costs. According to Frost & Sullivan, depending on total distance driven, a car sharing program can save up to 70% of the total transit costs for its members. Individual Membership. We offer a solution for individuals seeking an alternative to the high cost of urban car ownership. In a member survey we conducted, the majority of respondents report selling a car or electing not to buy a car when they join Zipcar. As a result, we estimate that the percentage of Zipster household income spent on transportation is substantially less than the national average, making urban life more affordable. Zipcar for Universities. We provide college students, faculty, staff and local residents living on or near campuses with access to Zipcars while helping university administrators maximize the use of limited on-campus parking and reduce campus congestion. Zipcar for Business and Zipcar for Government. We help businesses and local governments save money, meet environmental sustainability goals and reduce parking requirements by providing their employees with access to Zipcars. We have also partnered with residential property managers and developers who provide their commercial and residential tenants with access to Zipcar memberships and Zipcars. FastFleet. We offer a fleet management solution, called FastFleet, on a software-as-a-service, or SaaS, basis to organizations that manage their own fleets of vehicles. FastFleet enables these organizations to maximize efficiency and reduce the administrative costs of managing their own fleets by monitoring and improving per-vehicle utilization levels. Estimates of the car sharing market opportunity vary based on a variety of factors. According to Frost & Sullivan, revenue from car sharing programs in North America will increase to $3.3 billion in 2016, up from $253 million in 2009. Frost & Sullivan expects revenue from car sharing programs in Europe to increase to €2.6 billion in 2016, up from €220 million in 2009. We believe the Frost & Sullivan market forecasts are more likely achievable by 2020. See the latest SEC filings for a complete discussion of Zipcar’s business, financials, and risk. In addition to their traditional rental car businesses, Hertz, Enterprise and UHaul have launched separately branded car sharing operations. Connect by Hertz reports having more than 650 car sharing vehicles in select geographic areas such as New York, London and Paris. Enterprise has announced its WeCar brand, principally at universities and on some corporate campuses. UHaul has launched UCarShare in Portland, Oregon. All of these companies have long histories operating their core car rental businesses, but none of them has been specifically designed and built as a car sharing network. Therefore, they may have difficulty adapting to a member based service rather than a transaction based service. Our car sharing competitors also include a growing number of for-profit and not-for-profit operators in certain metropolitan areas, such as Chicago, Toronto, Philadelphia, San Francisco and London. Most of these competitors operate in only one city, and many lack a critical mass of vehicles to provide a member experience competitive with that of Zipcar. As a result, they do not benefit from the same operational efficiencies and economies of scale and may be less likely to invest in infrastructure to the degree we believe necessary to remain competitive.